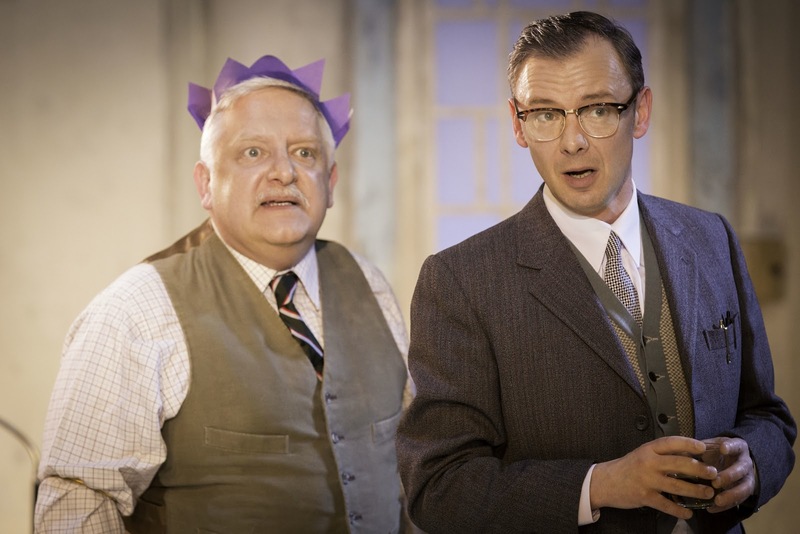 The Hothouse is a delicious treat of a Pinter play. Unashamedly political, it encompasses sexiness, absurdity and menacing violence, as well as some brilliantly comic moments. Simon Russell Beale is Roote, an ex-military man who leads the team at an undefined state institution, administering psychiatric treatments to its residents, none of whom are named, only numbered. John Simm is Gibbs his oleaginous but oh so perceptive number two, with eyes for Roote's job. It is Christmas, one patient has just died whilst another has just given birth to a child, apparently fathered by one of Roote's team. It is quite clear that Roote has lost his grip on managing the institution and Russell Beale plays him as a tragi-comic with gloriously controlled eye-popping incredulity. 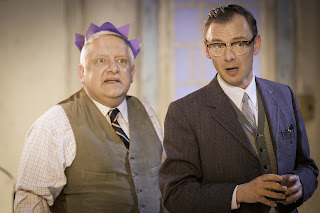 Think Basil Fawlty crossed with his long-term hotel resident, The Major and when in act two, Russell Beale directs his formidable acting firepower towards some perfectly timed slapstick involving whisky throwing and cake eating, the comedy is sublime. By way of contrast, clean shaven Gibbs is no laughing matter at all, though his repartee with Roote is as good a double-act as you are likely to see. He has the measure of his buffoon boss, along with his colleagues and his elegant yet smarmy and duplicitous servility is another masterclass of performance. Where his fellow staffers only aspire to climb the ladder of promotion, Simms scales it ruthlessly and when his ambition and motive demand that his colleague Lamb be subject to brutal Electro Convulsive Therapy (ECT), Gibbs does not flinch from arranging the shocking voltage to be applied. The reasons for patients' detention in this facility are never made clear, but the frequent references to “the Ministry” combined with Soutra Gilmour's brilliant set depicting a greying, publicly-funded government department, add weight to the suggestion that the unit adminsters a brutally harsh response to those who seek to challenge an authoritarian regime. Key supporting cast are Harry Melling's Lamb and John Heffernan's Lush. 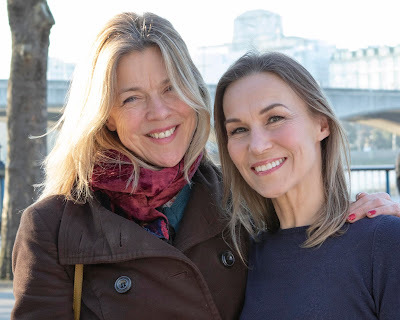 Both are on the faculty staff albeit with different responsibilities and both deliver impressive monologues, mastering Pinter's complex concepts and Melling's delivery of his character’s reaction to the ECT is harrowing to watch. Indira Varma is Miss Cutts, a seductively attractive staff member who, trapped in the stifling hothouse of the institution , craves male approval and knows how to use her body to attract it. That actors of the stature of Clive Rowe and Christopher Timothy have been recruited for critical but nonetheless tiny cameo roles, speaks volumes for the cache and impact of this wonderfully slick production. It's not a long show - each act barely 45 minutes or so, but the production is an accessible collection of performances that provides The Hothouse with a very fresh interpretation as well as also making it a useful introduction to Pinter for those not familiar with the writer’s work. Encapsulating absurdity and menace, as well as outstanding satire, this company rank amongst the best to be found on a London stage.